Consult with us prior to your next project. We provide guidance for pre-purchase of raw materials, detailing services, or both, which can drastically reduce your overall project schedule and put dollars in your pocket. We offer furnish-only and furnish-and-install contract services for any size project. Our ability to compete in distant markets is limited by project size and freight costs, but history tells us that our pricing is competitive for any job 100 tons or larger regardless of location. Our project management team supervises every phase of the project: project pre-planning, erection sequencing, material procurement, submittal approvals, production, shipping and erection. And we don't stop there. Timely submittal of LEED deliverables and close-out documentation ensure you'll have one less headache when closing out your next project. Call on us. You will agree that we're a class act and a worthy addition to any project team. Teaming with design partners ? including several nationally acclaimed design firms ? we can offer turn-key structural packages consisting of foundations and slabs, structural frames and lightgauge assemblies. Design services include architectural coordination, construction document preparation as well as construction assist and field inspections as necessary to ensure success on your next project. Steel is Green! 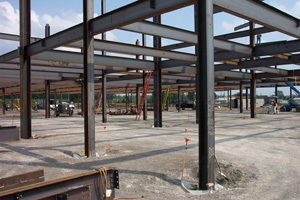 All structural steel meets USGBC's minimums for post-consumer recycled content to provide you with the most cost-effective approach in achieving your project's LEED certification. Your project may also qualify for regional credits depending on its location. Completed recycled content documentation and summary analysis are provided upon closeout of each LEED project.